From the air, before you even land, you notice the large expanses of greenery which is so rare nowadays. Once, some 11 years ago, I landed at the airport and there was no one to receive me. But people around were extremely helpful and strangers also offered to drop me to the hotel at no charge. The beach resorts are within 20 minutes drive from the city centre. So, even if you are in the city on business, you can opt for a stay at a beach resort as the city centre is easily accessible. There are lots of hotels to suit every pocket. One doesn’t see too many brands, but you would definitely find a Holiday Inn, a brand which is very strong in East Africa. Apart from New Africa Hotel which Sarovar Hotels manages, I would also recommend the recently launched Kilimanjaro. It has a fabulous view of the bay and is an excellent hotel. Renting cabs or taxis are the best way to go around the city. However, it is always advisable to get the cab booked through the hotel’s travel desk. There are a number of standalone restaurants which are very good, reasonable and popular. My favourite is Congo. This is a shack located in an area without any access by road and no electricity and opens only twice a week — Wednesday and Friday. It has only one dish on the menu, which is Chicken Congo. I am told he sells about 1,000 chickens on a single day. The Thai restaurant, Swasdee at New Africa Hotel and PanAsian at Kilimanjaro are my other favourites. There are places where you can drink and dance till the wee hours. But nightlife mostly revolves around casinos in the city. Makonde carvings made from ebony are famous in Tanzania. These are one of the best memorabilia one can buy. Apart from these, Kanga (local attire), handicrafts, tanzanite (stone, which is only available in Tanzania), Tinga Tinga paintings and other African art are also worth purchasing. Home-grown Zanzibar spices and Mtwara cashewnuts are also worth a pick. • It is better to take advice from hotel travel desk or any acquaintance in the city on what to avoid. • Don’t bargain while shopping on the street, but smaller shops will fetch you good deals. Walking after dark is not advisable. Keep all valuables in a safe and carry just enough cash. • Avoid encashing foreign currency on streets or any bureau de change. Avoid taking unknown taxis and always ascertain charges before entering one. • Do not carry original passports and documents when out in the city. 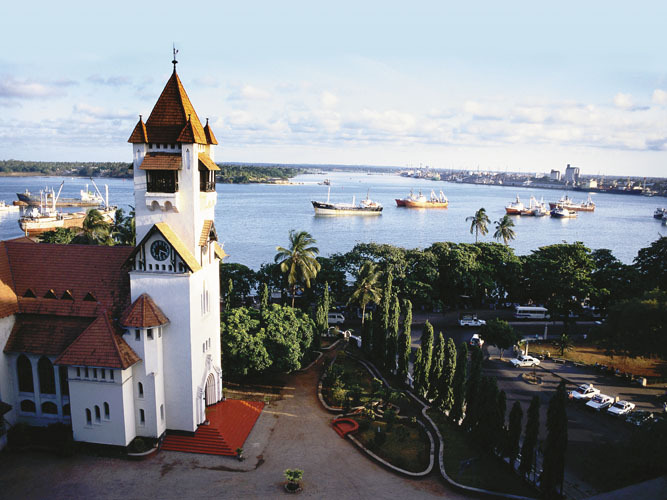 • The people in Dar es Salaam are very polite and humble. Treat them with respect and they will in return be extremely friendly and helpful.